On March 21, 1821 the Greek rebels started the siege of Kalavryta, making it the first Greek town that was liberated from the Ottomans, thus declaring the revolution for independence. In the morning of March 21, 600 armed fighters were sworn under the perennial plane tree of the monastery of Agia Lavra and according to some historians, said: “Not one Turk left in Moria (Peloponnese), nor in the whole world. 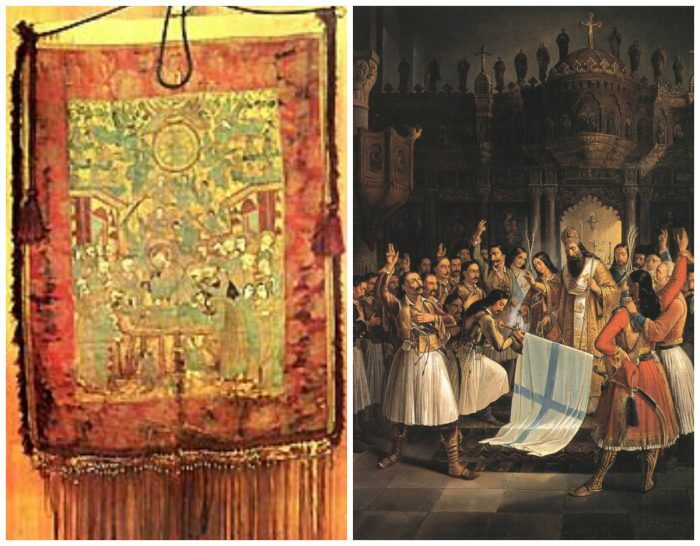 A meeting followed where Bishop Palaion Patron Germanos called on Greeks to revolt and raised the flag of the revolution, a tapisserie depicting the Assumption of Virgin Mary that was on the gate of the Temple of Agia Lavra. The Greek chieftains led by Sotiris Charalambis, Asimakis Fotilas, Sotiris Theocharopoulos, Ioannis Papadopoulos and Nikolaos Soliotis and Nikolaos Petmezas, took a small cannon from the Monastery of Agia Lavra and besieged the city fortress. The Turks under the command of Ibrahim Pasha Arnaoutoglou barricaded themselves in three towers and expecting military help from Tripolitsa. Four days later, the Ottomans succumbed and surrendered.